The topics for the next two weeks will be contemporary manners at home and in the business world, An Introduction makes the first impression, whether or not it is a good one depends on how well introductions are managed. In general, it is important to look people in the eye, speak clearly, stand for introductions (except at formal dinners) and use appropriate forms of address. If necessary, introduce yourself. If you forget someone’s name, admit it, apologize and ask for the correct pronunciation. THE RULE: The person who is named first is the one receiving the greater degree of respect or deference based on seniority or prominence. The other person is being introduced to them. In general, a younger person is introduced to an older person with the older person’s name stated first; a person of high rank or special prominence is named first and receives the introduction; and the person of lesser rank is introduced to them. 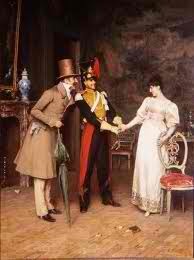 In social situations, men are introduced to women. All persons present should be included. THEN: Make eye contact. Smile and say the person’s name. Always shake hands (right, unless there is a disability), if someone offers his/her hand. Address people formally. Make conversation. NOTE: In business, clients and customers have precedence over fellow associates, regardless of rank.